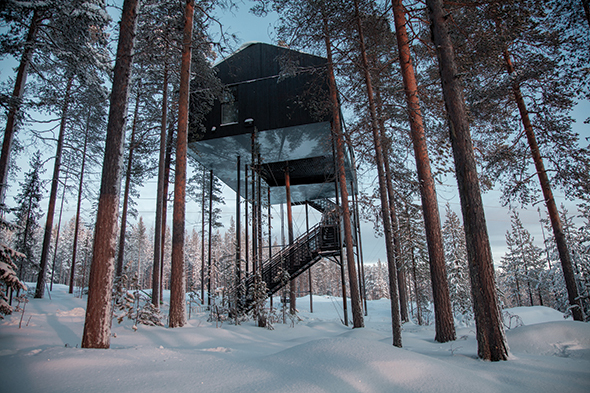 A soaring, modern treehouse hotel in Northern Sweden sits amidst an unassuming pine forest canopy, beckoning guests with aerial views. Treehotel offers visitors a unique experience to connect with nature, and the hotel’s most recent magical creation, in collaboration with renowned design firm, Snøhetta, offers an innovative approach to melding the environment with architecture. The indoor floors are made of a modern ash wood, and the walls are outfitted with white birch. The interior is sleek and modern, featuring large windows overlooking the far-reaching greenery outside. Guests may be able to spot the breathtaking Northern Lights on an especially clear day from floor-to-ceiling windows. The large space can fit up to five guests and boasts 55 meters of living space including two bedrooms, a lounge and a terrace. 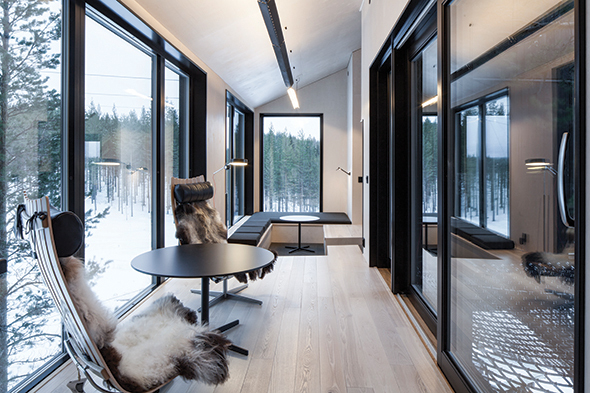 “The design of the 7th room aims to bring people and nature closer together, extending the cabin’s social spaces to the outside and further blending the distinction between indoor and outdoor,” explained a press release. Both bedrooms also offer skylights, so guests can fall asleep to twinkling stars, further blending the outdoors and the modern interior environs. A net patio includes a pine tree growing through it and branches spreading out, allowing guests to sit or lay comfortably on its limbs. Snøhetta collaborated with Ateljé Lyktan, a well-known lighting company, to create custom lamps and suspended lights made from birch veneer with piano hinges to adjust the lighting. The hotel, located 100 kilometers from Sweden’s Lule airport, feels miles away from civilization. “Why not create a hotel that gives people a chance to experience nature amongst the tree-tops, while also providing a uniquely designed housing experience?” says Treehotel’s website. “These questions led to the creation of Treehotel in Harads – a place where nature, ecological values, comfort and modern design are combined for an exciting adventure.” In collaboration with leading architects and designers from around the globe, the unique “tree rooms” were created and suspended four to six meters above ground. Treehotel includes seven different residences, with the 7th room marking its most recent endeavor. Other dwellings include a UFO-shaped creation suspended in trees and the original square-shaped capsule, “the cabin.” For guests, an experience at Treehotel is all-encompassing. Breakfast, lunch and dinner are served at Britta’s Pensionat, which is a short stroll away from the cottages and serves local cuisine, such as reindeer and caviar of Kalix in a cozy setting. 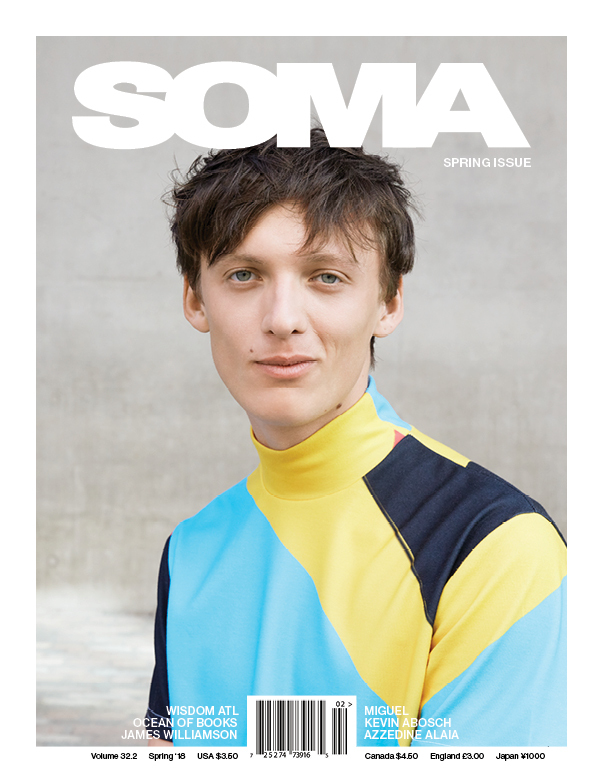 Snøhetta, which boasts offices around the world including New York City, San Francisco and Oslo, are behind some of the world’s most innovative design projects. They designed the September 11 Memorial Museum Pavilion at The World Trade Center in New York City and were behind the expansion of the newly re-opened San Francisco Museum of Modern Art. Currently, they have a number of projects in the works including the famous Michelin-starred French Laundry’s kitchen expansion and garden renovation in California.